What is An Insurable RV? In 13 years of providing RV insurance we’ve gained a bit of experience. By experience I mean we get asked to insure all types of things. So much so that it necessitates a few definitions. Since we are talking about RV insurance, let’s start with defining what an RV or Recreational Vehicle is. A Recreational Vehicle comes in two general types–Motorized units and Non-motorized units. Motorized units are Motorhomes. Motorhomes are divided into three classes including Class A, Class B, and Class C. Non-motorized units are typically of the towable variety and include conventional travel trailers, fifth wheels, toy haulers and pop-up campers. That said, not all “RVs” are insurable. So let’s define what an insurable recreational vehicle is. While different insurance companies have different appetites for risk, most have very similar definitions of what makes an RV insurable. For example most insurable RVs have the following equipment. With few exceptions these are required for all insurable RVs. So, let’s talk exceptions to these hard fast rules. Class B Motorhomes, or camper vans – While Camper vans are not required to have all of the equipment provided above, they are still required to have a fresh water hook up and a separate 110 volt electric power hook up. In addition a Class B motorhome must include at least two of the following: sleeping facilities, kitchen or toilet facilities. If you have an insurable RV and are in the market for RV insurance contact us today at 877-784-6787 or start your quote online today. This coverage explanation is for illustration purposes only and is general in nature. Coverage explained here may not apply to your policy, State, company, or situation. For more information about how your policy would respond in the event of a loss, please refer to the terms and conditions and declarations page of your policy. https://www.gilainsurance.com/wp-content/uploads/2018/07/logo-300x54.png 0 0 Tosten https://www.gilainsurance.com/wp-content/uploads/2018/07/logo-300x54.png Tosten2019-03-21 05:47:122019-03-06 17:48:45What is An Insurable RV? Perils insurance against, what in the world does that mean. Here’s an insurance guy trying to explain the insurance options for rental property insurance. 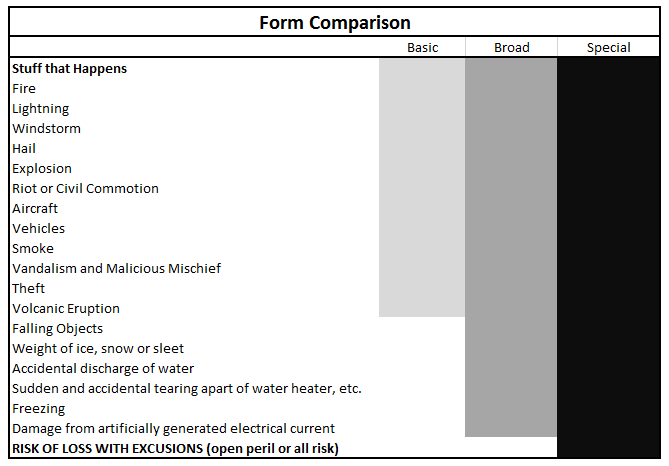 Rental Property Insurance Coverage – Section I policy Form – Perils insured against. Perils insured against…. What does that mean? Let’s see if I can take off my insurance man hat for a second and put on my investor hat. Why? Because I believe this is where A LOT of insurance folks tend to lose their clients. It’s a simple thing, but we often get too caught up in the insurance lingo when we are explaining this stuff. So, here is my best attempt. A peril is stuff that happens to cause a loss. So, stuff that happens, for which you are insured, is a covered peril. Okay. Sometimes you will hear an adjustor or an insurance agent say something like, “in the event of a covered loss.” Well, what in the world is a “covered loss?” How could you know? That’s where the policy form comes into play. Policy forms are like a series of hooks on a wall, so we take our policy and we hang it on a form, then every time we read something like “in the event of a covered loss,” we can look at our hook, and we see if it’s covered in the policy. Okay, so there are essentially 3 types of “hooks” or options for rental property insurance buyers. There are basic, broad, and special forms. That’s easy, but of course you will often hear agents referring to these as DP-1, DP-2, or a DP-3. This basically says it’s a dwelling policy with this kind of form… Now, each form has a list of stuff that gets covered. Basic being the worst and special being the best. Now that I have gone all insurance guy on you, let me break it down visually so that you can understand it. THIS IS A GENERALIZATION, CHECK YOUR POLICY! THERE ARE THINGS THAT CAN CHANGE THESE LISTS LIKE THE PROPERTY BEING VACANT OR OTHER FACTORS! Now before you get all crazy and say, “hey Broad has most of what special has, I bet I can save some money,” slow your roll. Let’s look at that last one; Risk of Loss with Exclusions. What does that mean? It means that unless the insurer specifically excludes it, it’s covered. That is a HUGE difference. In the first two options the insurer will only cover a handful of things, and if it’s not on the list, then it’s not covered. The last option, the special “hook,” says if it’s not excluded, its covered, which leaves hundreds of covered situations with a handful of exclusions. LONG STORY SHORT? You’re special so get special. It’s as simple as that. Start your quote online or call us for an immediate quote 1-877-784-6787. 1. It pays for the damage you cause to other people’s property and for the injuries you may cause to others. For example, in the case of an auto policy, if you crash into someone else’s car the liability portion of your policy pays to replace their car, and the medical bills due to the bodily injury that you caused to the other party. 2. It pays for your legal defense in the event that you are sued for something covered in the policy. For example, in the case of a homeownwers policy, if someone slips and falls on ice on your front porch, and sues you, the liability portion of the policy would provide coverage to defend you against the suit. However, there are different types of liability, and that are offered on different types of policies. Personal Liability – This is a broad form of liability often found on homeowners policy. It provides coverage for the bodily injury and property damage that an insured person is found to be legally responsible for. It can provide coverage on the home’s premise, but also away from the home’s premise. Premise Liability – This liability form typically is found on dwelling policies where the home is a secondary home (meaning you have personal liability from your primary homeowners policy), a rental property, or a vacant home. It also covers bodily injury and property damage, but it only provides coverage when the cause of the loss is on the insured premise. In other words, if something were to happen at the dwelling because it was unsafe and you were sued, then Premise liability would respond, but unlike personal liability it provides no coverage off the insured premise. Personal Injury – This liability can be Excluded OR Included on a given policy, so if you want this coverage, you need to make sure the company you have chosen makes it available, and purchase it. Personal Injury excludes things such as False Arrest (keeping someone against their will even for a short period of time), Wrongful Eviction or Entry (Landlords pay attention), Invasion or violation of privacy (Landlords pay attention), and slander and defamation (have any kids on the internet?). You can see why this is important, but this is also often excluded under personal or premise liability, so if you have these exposures (you probably do) you will want to consider adding this to your policy. How much liability to purchase? That is a good question, and one that only you can make, but more is better which is why we offer an umbrella policy so that you can purchase additional coverage.